U.S. Already Feeling Consequences Of Global Warming, Draft Report Finds : The Two-Way The document states that humans are causing climate change. The findings are at odds with statements by President Trump and key members of his administration. 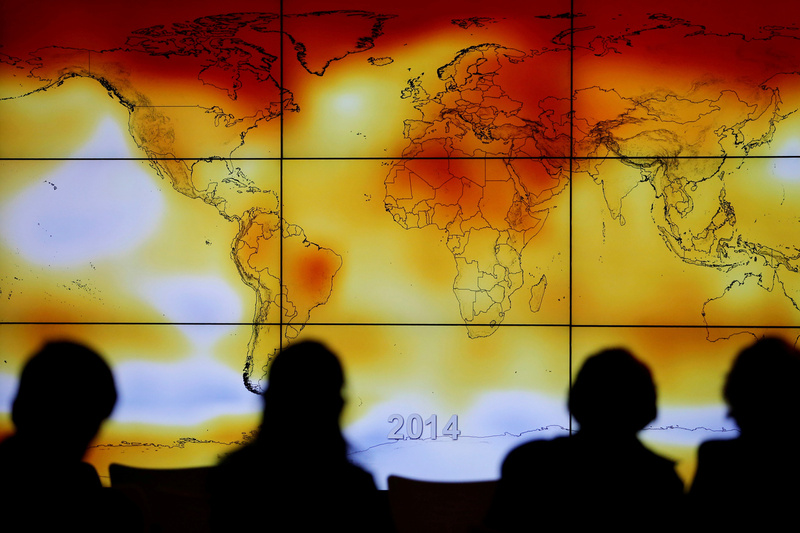 Participants look at a world map showing climate anomalies during the World Climate Change Conference 2015 in France. A draft government report on climate, which was released by The New York Times ahead of publication, says the U.S. is already experiencing the consequences of global warming. The document, which was released ahead of publication by The New York Times on Tuesday, says Americans are seeing more heat waves and rainfall as a result of climate change. The report, known as the Climate Science Special Report, is part of the National Climate Assessment, which is mandated by Congress every four years and provides a synthesis of the federal government's knowledge about the state of the climate. Previous assessments have shown that climate change is already affecting the the United States' weather and economy. "Many lines of evidence demonstrate that human activities, especially emissions of greenhouse gasses, are primarily responsible for observed climate changes in the industrial era. There are no alternative explanations, and no natural cycles found in the observational record that can explain the observed changes in climate." It concludes with high confidence that humans are responsible for effectively all observed warming since 1951. That statement is directly at odds with statements from Trump and key Cabinet members. The head of Trump's Environmental Protection Agency, Scott Pruitt, has said there is "tremendous disagreement" on the impact humans have had on the climate. And in June, Trump announced that the U.S. would withdraw from so-called Paris agreement on climate change, which is the main international effort to reduce greenhouse gas emissions. Trump sent official notice of the U.S. intention to withdraw late last week. "Just because we pulled out of the Paris accord doesn't mean we believe in climate production," Trump's ambassador to the U.N. Nikki Haley said on NBC's Today show. "What we're saying is, we're not going to sell out American businesses to do that." At the time it was made public by the Times, the draft report had been completed for months and was awaiting the administration's approval ahead of publication. However, key positions involved in vetting the report, such as the presidential science adviser, have gone unfilled by Trump. The Times was the first to report on the draft report's conclusions. On Tuesday, a White House official noted that "drafts of this report have been published and made widely available online months ago during the public comment period. The White House will withhold comment on any draft report before its scheduled release date."